Alpacas communicate by softly humming. Alpaca fiber is hypo-allergenic and contains no lanolin. Alpacas are alert, intelligent, curious and predictable. Alpacas are small and easy to care for. Alpacas are safe and gentle to be around. Alpacas produce fine, luxurious and valuable fleece that is shorn once a year. Alpacas make wonderful pets (need at least 2). Alpacas come in 22 natural, gorgeous colors. Alpacas require minimal fencing-they do not challenge fences. Alpacas do not have to be killed in order to be profitable. Alpacas are easily transported, even in a minivan! Alpacas are earth friendly and tread gently on the land. Alpacas are adaptable to various habitat and climates. Alpacas are hardy and relatively disease resistant. Alpacas have a long reproductive life. Alpacas are easy to care for; even for us "city folk." Alpacas will amuse, amaze and capture your heart. And.....alpacas will change your life! Alpacas are bred and raised in the US for their exquisite fleece, called "fiber." Alpaca fiber is very fine, similar to angora and cashmere and the finer alpaca is suited for fabrics worn against the skin. Garments made from alpaca fiber can be extremely thin and still very warm. Alpacas originated in the Andes Mountains of South America and have since been exported all over the world. Originally imported into the US in the 1980's, the US border has since been closed to imports in order to protect the US alpaca market. The alpaca market in the US has been extremely strong all these years with the average sales prices at national auctions in the $20,000 range, per alpaca. 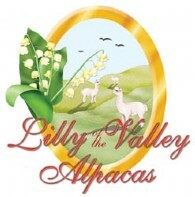 Alpacas eat grass, hay, and grain (alpaca or llama pellets). They are less of a strain on their environment than horses and cows, eating less and not tearing out the roots of plants they chew. We could go on and on about the delightful, unusual and rewarding facets of raising these fantastic animals, or you could come over for a visit and see it for yourself!